Friday night is game night but you’re bored of those silly board or guessing games? Maybe it’s time to take your family into a wild adventure in the jungle, by playing the replica board game of Jumanji. Choose your game mates and set out on a deadly journey. Snapping crocodiles, rhinos running through your house, deadly plants and even a lion or two who may occupy your sofa… they are only a dice roll away. 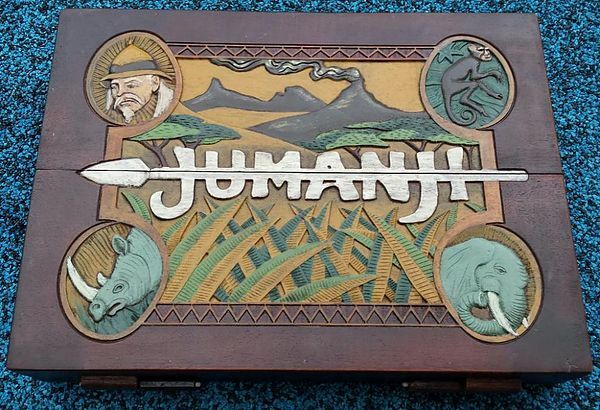 This Jumanji board game is an exact replica of the game board seen on screen in the 1995 Hollywood blockbuster Jumanji, starring Robin Williams. When his character Alan starts playing the game, he becomes trapped in the jungle with the only option to be saved is rolling 5 or 8. It takes several years before Alan is saved from the dangerous jungle. With the game that changed their lives still putting them in a dangerous situation, they know there is only one option to end the nightmare. Finishing the game. Ending the board game means they have to survive many more horrifying creatures of the jungle who might stalk or hunt them till the very end. After the succesful movie Jumanji based on the book with the same name, it’s now time for the board game. Made by a professional woodwork artist, and based on the real thing, this board game is made 100% of African mahogany wood. The board game has been accurately assembled and is hand painted. No doubt this board game is a real must have for collectors and cinefiles. The board game includes four tokens and dices with the tokens being completely handmade and sculpted as an elephant, a rhino, a monkey, and a crocodile, which makes the game playable for two to four players. Make sure you want to start playing since this is the only game that pursues you. Roll the dice and decode the rhyming cards that could predict disastrous consequences. Rhino’s running through your house, a monkey tail growing on you or even someone hunting you. Use the eight sided dice to rescue your fellow player before he’s being swallowed by the lurking quicksand. But if you fail to escape from the hazards of the jungle, it might swallow you whole. Once you start to play, the only way out is to finish the game and call out Jumanji. It’s the ultimate board game for an adventurous game night with friends or family. Fans of the movie had to wait for over twenty years untill this accurate board game became a reality. It looks so much like the real thing it’s scary. The game has the same instructions and warnings on both sides of the covers as in the movie. The question is: ‘Are you brave enough to buy this game that brings back a nostalgic feeling to a lot of people of the 90’s generation who’ve seen the movie in their childhood?’ Buying this authentic game is almost as finding the real thing on a construction site or finding it being washed up in the sand. Can you hear the drumbeats getting louder already?